WSLHD Administration and Customer Service Development Day at Auburn Hospital. Noel Posus (Manager, workforce development programs-training & development) presenting to attendees. They are the first people most hospital visitors encounter, and our frontline administration staff have been reflecting on that responsibility and the positive impact they can have. 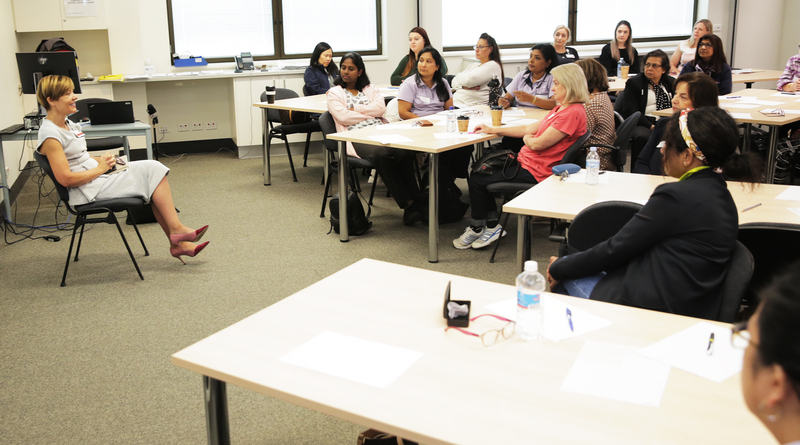 The inaugural Administrative Professional Development Days were held at Auburn Hospital on Wednesday and Thursday last week, bringing together dozens of staff from all Western Sydney Local Health District (WLSHD) facilities. WSLHD Executive Director Operations, Robynne Cooke, said the feedback from this week would help inform how the training is rolled out to all front-line staff in the near future. “This group of staff are so important in how they communicate and provide support to our vulnerable patients,” she said. Executive Director Operations Robynne Cooke sat and spoke with the attendees to assure them the district has their back. Robynne said it was the first time the district had invested in administrative staff in this way. “We wanted to provide a professional development opportunity exclusively for our administrative staff, and to listen to their stories and ideas as well,” she said. Auburn Hospital administration officer Andrew Day said he hoped the eye-opening day would lead to cultural improvements. “These days are extremely valuable. Coming from a nursing background, we do this all the time,” he said. Some of the key feedback from staff was a desire to improve on-boarding and ongoing staff development. Workforce training and development manager Noel Posus led the proceedings, and challenged staff to identify one area where they could improve by 10 per cent next week or next month. “One of the benefits of events like this is actually getting together and sharing stories, communicating with each other about what works and what doesn’t work, and how we can improve things,” he said. Robynne thanked the managers, People & Culture, health information teams and all the participants for making the days possible.